The Indian spices make this so tasty! Remove outer leaves and core. Keep the head intact. Mix all the ingredients and set aside. 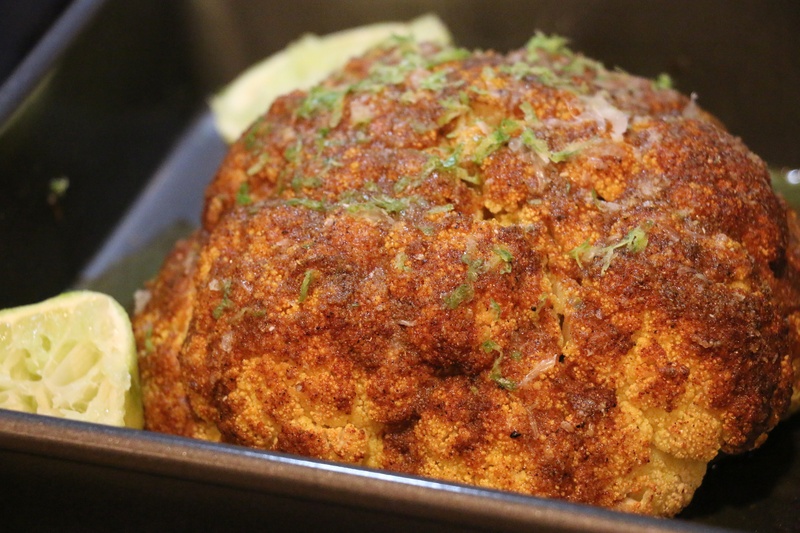 Place the cauliflower in a roasting pan and brush over the spice rub. Take the foil off and continue to roast for 15-20 more minutes or until a skewer or paring knife is easily inserted through to the middle. To serve, cut into wedges with cut wedges of lime and plain yogurt. This looks amazing! My significant other is OBSESSED with curry spice, definitely going to have to try this. thanks for the recipe! You’re very welcome, I hope he likes it. I used to hate cauliflower until I learned to roast it. Now it’s my fave winter vegetable!